Apptimizer by AppBrain.com - Analyze. Optimize. Get popular. Do you want to generate more downloads? 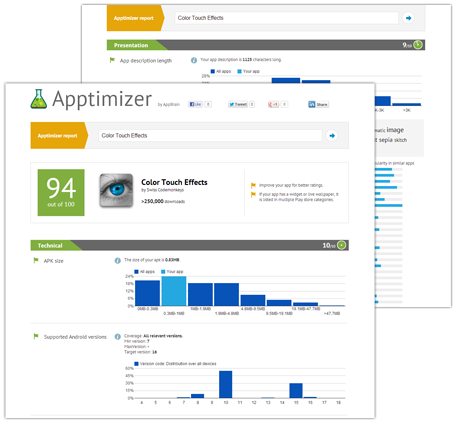 The AppBrain Apptimizer investigates key aspects that influence your app's popularity and suggests concrete actions when weaknesses are detected. Get tips on how to present your app in Google Play Store. Find out how your app's key properties compare to the entire app universe. Learn how users recently judged your app. See how many devices your app can reach. Use the search bar at the top to find your app and generate your personalized report.